Paso Robles is going to be the next Napa. If you don’t believe me (Why should you? I’ve never been to Napa), then take it from a glass of mind-bending Paso zinfandel or syrah. I’ve been traveling to the area extensively for business since 2006 and sneaking in tastes whenever customers would allow. Fortunately, this was often, and so I’ve been able to take in much of the area and learn how to best indulge while there. Paso Robles is a small town of just over 30,000 people located almost exactly halfway between San Francisco and Los Angeles. The city is roughly 30 miles from a stretch of fantastically rugged Pacific coastline. Getting to Paso Robles (pronounced “PAH-so ROW-blays” if you have some Spanish in you, “PAS-so ROW-bulls” if you don’t, and just “Paso” if you’re lazy) is best accomplished by flying to San Luis Obispo via Los Angeles or San Francisco. A fair warning: This does involve flying in a twin turboprop airplane. If you’re skittish about smaller airplanes, flying to San Jose and making the three-hour drive might be a better choice. You can admire the miles of cauliflower, lettuce and other vegetable fields along the way brought to you by the Dole company. Because I’ve been primarily a business traveler, the Holiday Inn on the north side of town has always been my choice. You’ll never have the best stay of your life at a Holiday Inn, but you’ll never have the worst, either. Be forewarned that the cinnamon rolls have 500 calories a pop. Further south in a slightly better location, you’ll find a brand new Marriott that offers a bit more plush accommodations and a hotel bar. 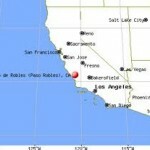 If you’re in the mood for something a bit less “big box,” Google up the Paso Robles Inn. This historic spot boasts natural hot springs and gardens that hearken back to Paso Robles’ 19th century history. Although I’ve never stayed there, customers who have rave about the experience. One your ready, do a cannonball into Paso Robles dining and start with the best restaurant in the area ““ McPhee’s Grill in Templeton. 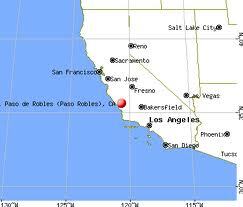 Just a few exits south of the Paso Robles area, McPhee’s sits in a town right out of 1850. When you drive down Main Street, you feel a cowboy on a horse could draw up next to you at any moment. By foot or by hoof, get seated at McPhee’s and start scanning a wine list which is brimming with local wines at reasonable mark-ups. Even though this would be a fantastic spot for a liquid dinner, don’t forget about the food, starting with the sweet potato fries. Once in a while, McPhee’s offers a bone-in ribeye that is insanely wonderful. Order this medium rare and ignore your friends when they tell you not to use your hands — pick up that bone and work it until the crÃ¨me brulée shows up. If you’re still not ready to go to bed, take the Spring Street exit on your way back north and follow it to Paso Robles’ town square. Lining this small park are an abundance of night spots, including a few wine bars. Paso’s wine bars offer surprisingly poor wine at high prices and are very skippable. Instead, hop over to the Crooked Kilt for ciders and local beers. Level 4 and the Downtown Brewery are more traditional nightclubs, louder and more dimly lit ““ perhaps an advantage depending on what your goals are for the evening. Start by visiting Turley straightaway. Usually they’ll be pouring recent releases of single-vineyard zinfandels from Paso and from Northern California in a new tasting room that is absolutely beautiful. Turley’s tasting fee is among the highest in Paso at $10, but it does include a complementary glass. A brief aside: Start thinking how you’ll get wine home. Most places will ship, but if you buy two here and three there, that’s a lot of shipping charges. My favorite has always been to check it through with the airline. Now in the days of paying for checked luggage, it might cost you $25 to $50, but still worth it in my opinion. I’ve never had wine in a styro shipper become damaged at the hands of an airline. Just please do a good job taping! Back at Turley, they sell shippers for a small fee. Not all places sell shippers, so buy here if you think there’s any chance you’ll want to check/ship wine home yourself. I usually get a 12 bottle shipper, but I’ve been known to go to 24 on occasion. Take a right out of Turley and head up Vineyard Drive as it winds its way towards Hwy. 46W. Once you come to the intersection, start looking for Zin Alley signs and follow them to the Zin Alley tasting room. Once inside, you’ll undoubtedly meet Frank Nerelli, a third-generation Paso zinfandel producer. Ask him to tell you his story and you’ll get a great view of Paso politics and history. Frank is making some of the best zinfandel in Paso Robles, and in a fundamentally different style. Where I feel like most in Paso are trying to exploit zinfandel’s power, he is showcasing its nuance ““ and doing it expertly. Budget at least an hour with Frank, and spend at least 30 of these minutes asking for seconds on the zinfandel port. Go ahead and buy a couple bottles now with the confidence you will not find a better one in the area. I promise to buy back any bottles you don’t want. For lunch, head back to the town square and cruise the small bistros. Then head north on Spring Street and hang a left on 24th Street. This turns into Adelaida Drive and eventually connects to Vineyard Drive, where many wineries are located. Enjoy the windy roads and amazing views, especially if you’ve got a car with good cornering. The Adelaida winery forever has a spot on my Paso rotation because of an epic 2004 roussanne. While they haven’t been able to replicate that wine in more recent vintages, l think they’re making some very good whites at good price points. Continue down Adelaida Drive to Tablas Creek. Partially owned by the Perrin family of Chateau Beaucastel fame, Tablas Creek is making some very interesting blends from actual Beaucastel vines. Make sure to try their Rhone blends called Espirit Du Beaucastel. Head back to your hotel and get cleaned up for dinner because you’re headed down to San Luis Obispo for a quick tour and another amazing meal. SLO has vigorously defended its downtown to keep out most chain outlets, which has resulted in a unique, and very Californian, downtown experience. Get to town 30 to 60 minutes before dinner so you have time for a walk. For dinner, Luna Red on Monterey Street is your place. The tapas are the draw here; do not miss the duck confit crepes! The wine list is another reason to drive all the way to SLO. Bottles you can buy at Paso wineries for $40 are listed for $48 ““ the way it should be. This is a good spot to try some wines whose sites you’d like to visit on your trip. Time to dry out a little and head west to the Pacific. Get on Highway 46W, and “go until you can’t go no more.  You’ll then be at the ocean and the famous Hwy. 1. 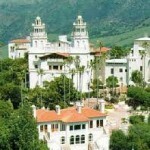 From here, you should drive north to Hearst Castle. 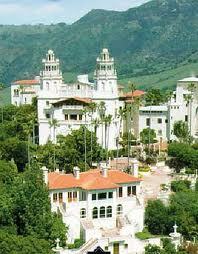 George Randolph Hearst plundered and/or duplicated hundreds of treasures from Europe and created quite an estate. Head back east on Hwy. 46 and round out your day with two more tours. First hit Windward, which is making Monopole Pinot Noir. To complete the Burgundy impression, they have even hired a buxom young French woman. And do not miss Booker, on Anderson Road just off Hwy. 46 on your way back to town. Booker, which is selling some amazing grenaches and syrahs at great price points, is only open Thursday to Saturday, so plan accordingly. You’ve had a big day, but save a little charge in your battery for your last meal at Artisan. This is arguably Paso’s finest restaurant (McPhee’s is the argument), with price tags to match, but their food is unique. Covers the high points for sure! Booker, Windward, and Turley are must stops. A few other gems not to miss: First, Firestone Brewery in Paso, some of the best beers made in the country. Second, Make it to Los Olivos and hit Saarloos and Sons Winery. Great wines, especially the Chardonnay and syrahs, and pair the tasting with their gourmet cupcakes.